Sail & Snorkel Excursions. Sunset Dinner Cruises. Dinner & Sail. Cocktail Cruises. Catamarans. Private Charters for small families or large groups. Catering. Premium Bar. Music. The Seahorse 1 is a 53 catamaran along with her sister ship The Seahorse II a 63 catamaran. Our newest and largest addition is the Seahorse III a 65 catamaran. These catamarans feature a spacious covered bar and lounge areas perfect for cocktails, hors d' oeuvres, buffet lunches and dinner parties. There is cushioned seating, private bathrooms and accommodations for up to 280 passengers. Our professional captains and enthusiastic crew promise you an experience of a lifetime. Click HERE to download the Seahorse Sailing Brochure. 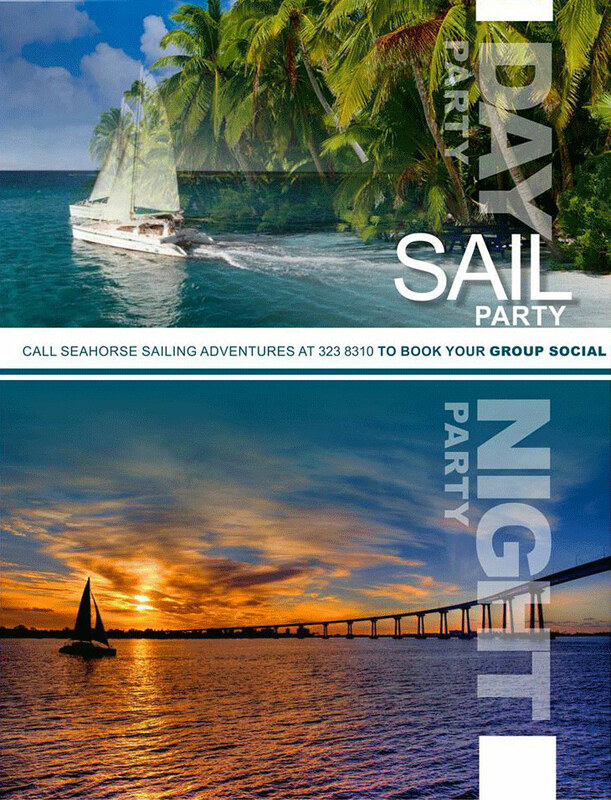 Our full-time sales staff at Seahorse Sailing are experienced event planners. We'll ask you certain questions regarding the size of your group, the type charter you'd like, and most importantly, what you (or your company's) objectives are. Then, we will assist you in selecting the right event for your group! Charter pricing will depend on the boat size, the number of guests in your party, the menu you choose, and length of charter. Our event planners will be more than pleased to send you a proposal based on this information. Enjoy morning and afternoon snorkeling trips aboard one of our state of the art sailing catamarans. This experience lasts 3 hours and takes you to one of the Bahamas most beautiful reefs. Trip includes all equipment and instruction, your choice of one rum punch, soft drink or bottled water. Bring a bathing suit and a big smile! Daily Snorkel Trips depart at 9:00 a.m. & 1:00 p.m. from the Atlantis Marina. Sunset Cruises are twice weekly on Wednesdays & Saturdays evenings at 5:00 p.m. (6:00PM during summer) for a 2 hour cruise. Includes a local Bahamian dinner & one rum punch, soft drink or bottled water. Private charters priced according to group size, destinations and length of charter. Enjoy morning and afternoon snorkeling trips aboard one of our state-of-the-art sailing catamarans. This experience lasts 3 1/2 hours and takes you to one of The Bahamas' most beautiful reefs. Trips include choice of one rum punch, soft drink or bottled water. Experience a sailing and snorkeling adventure in the crystal-clear turquoise waters of the Bahamas. Equipment provided & instruction available. Departs: 9:00 a.m. and 1:00 p.m. Enjoy a Bahamian sunset from the ocean. An intimate and relaxing setting for individuals and groups. Departs: 5:00 p.m. (6:00 during Spring & Summer). Bring a bathing suit and a big smile!